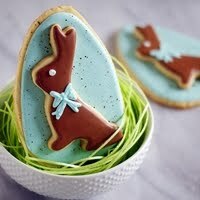 While I made these to be Easter egg cookies, they don't scream EGG to me. I think they're perfectly cute for plain ol' (are there really plain ol' ?) 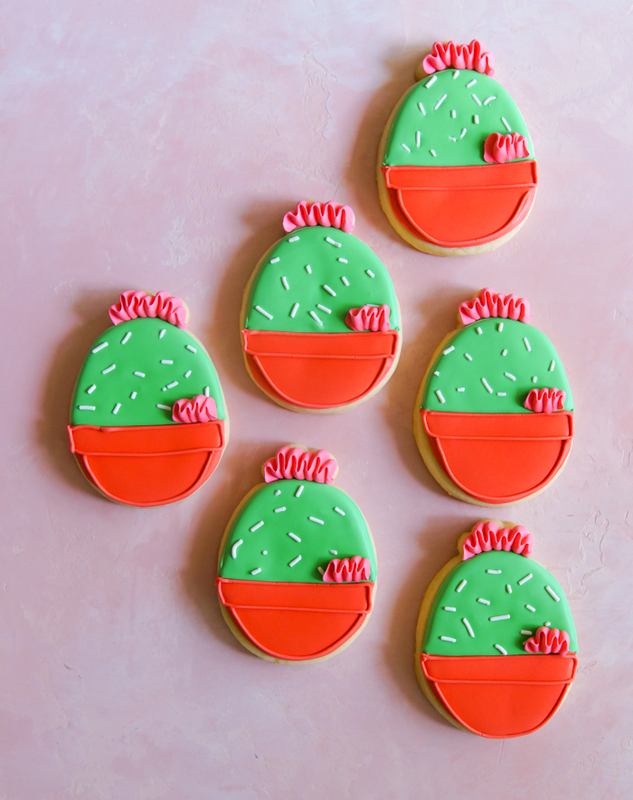 cactus cookies. You guys...they're so easy and fun to make. 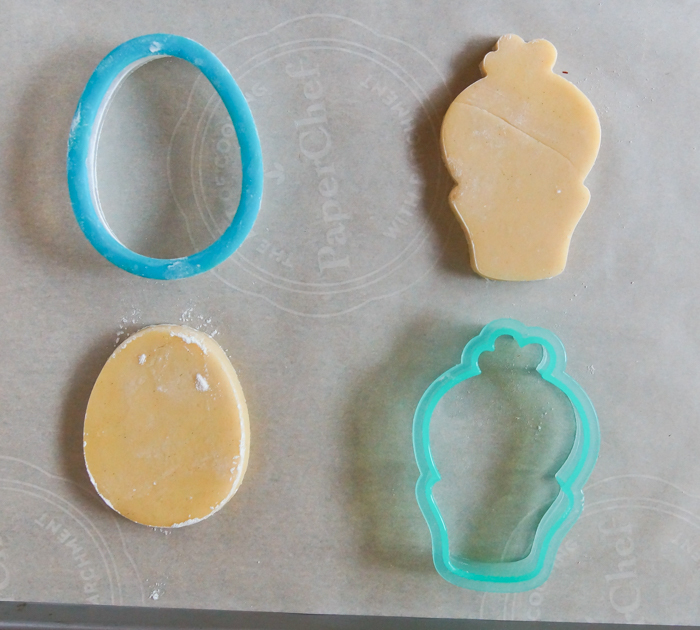 I did another "doctoring" of two cookie cutters just like with the unicorn egg cookies. 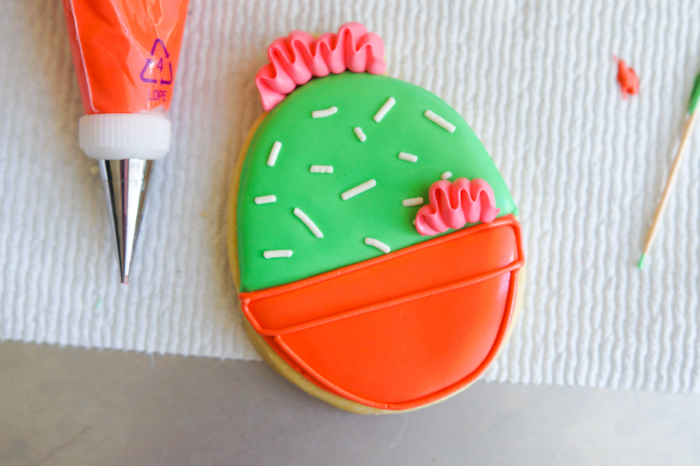 This time I used an egg and Sweet Sugarbelle's cactus cutter...just the top bit of it. 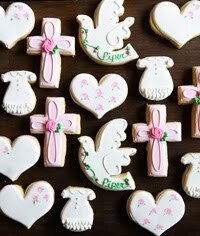 You could use any bit of a small flower cutter, or even the edge of a small scalloped oval or circle. 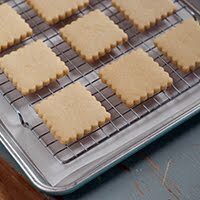 Press the shapes together and freeze for 10 minutes before baking. 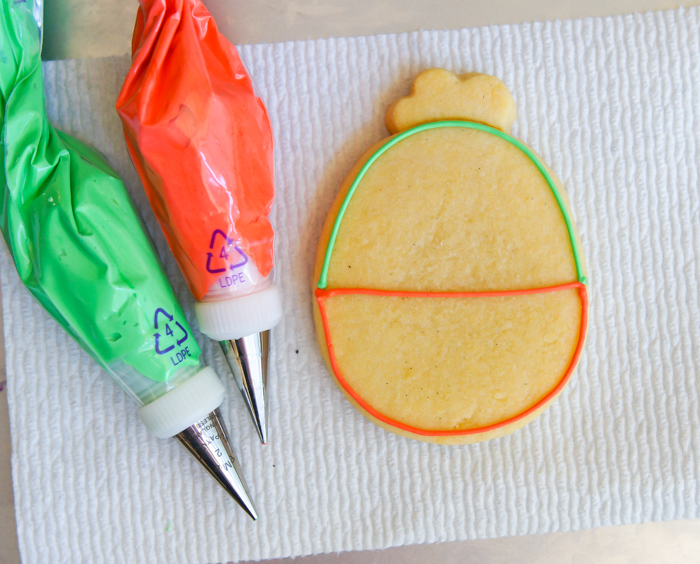 This will help the pieces to join while baking. 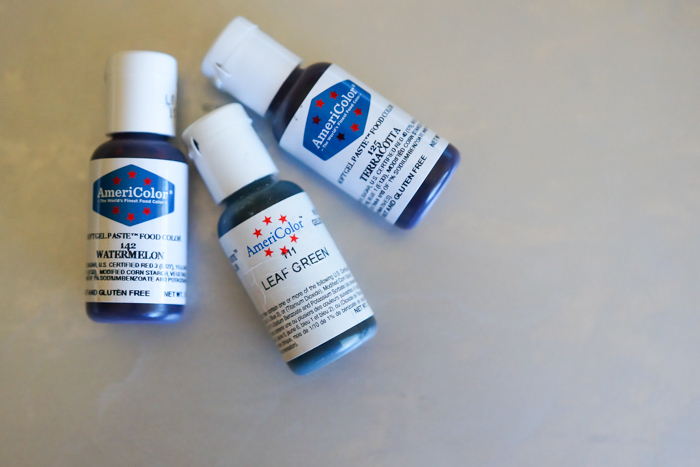 I used three different Americolor gel paste food colors to make these. Two were new to me: Watermelon and Terracotta. LOVE both of these colors! 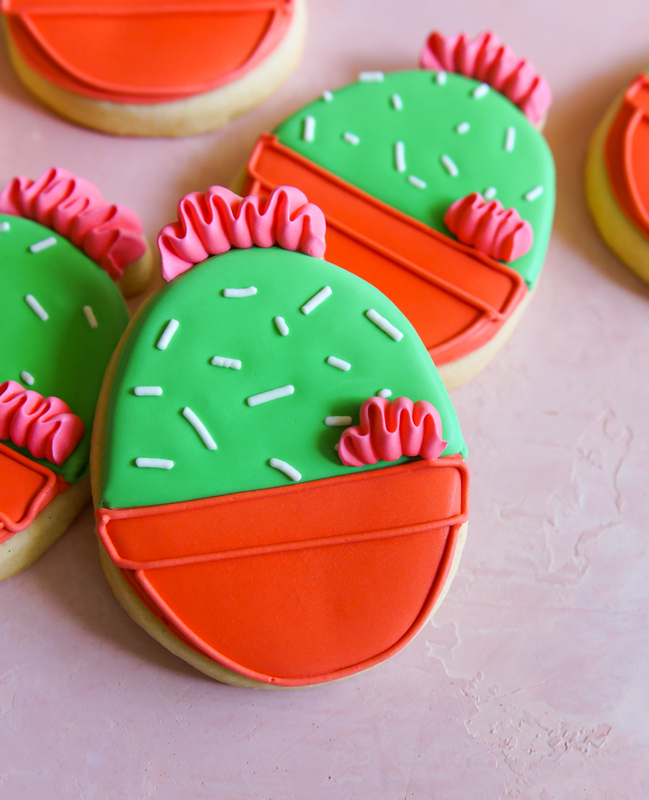 On the cacti, I think the flowers would have popped more had I used a red or even a lighter or brighter shade of pink. I do love that watermelon color though...and I hate watermelon. I would say if you love watermelon we can't be friends, but I'm married to a watermelon-lover, soooooo....I tolerate it. 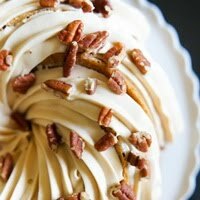 Don't tell me you like Tres Leches cake, though. That's where I draw my friendship line. BUT I DIGRESS. 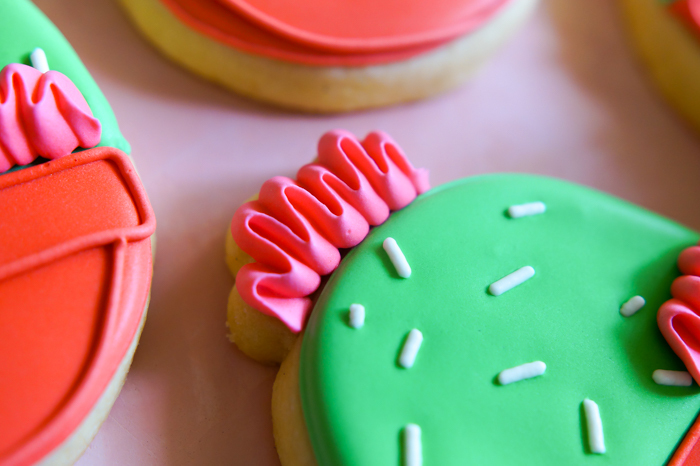 Those cactus flower rufflessssssssssssssss!!!!!!! In. Love. The cactus thorns are just white jimmies. So cute! So easy! 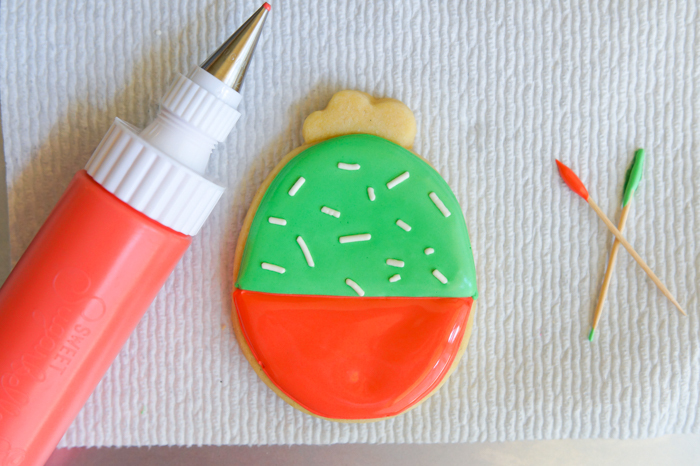 Use #2 tips to outline the cactus and planter in green and terracotta. 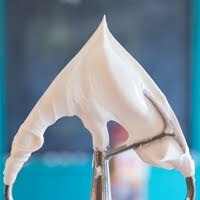 Reserve some of the terracotta icing before thinning. 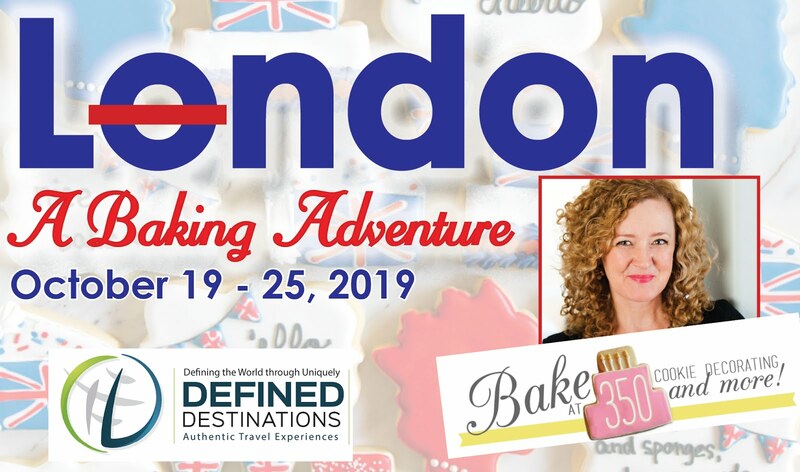 Thin both the green and terracotta icing with water, a bit at a time, until a ribbon of icing dropped back into the bowl disappears in a count of 2-3 seconds. If too thin, add sifted powdered sugar. Cover with a damp dish towel and let sit for several minutes. 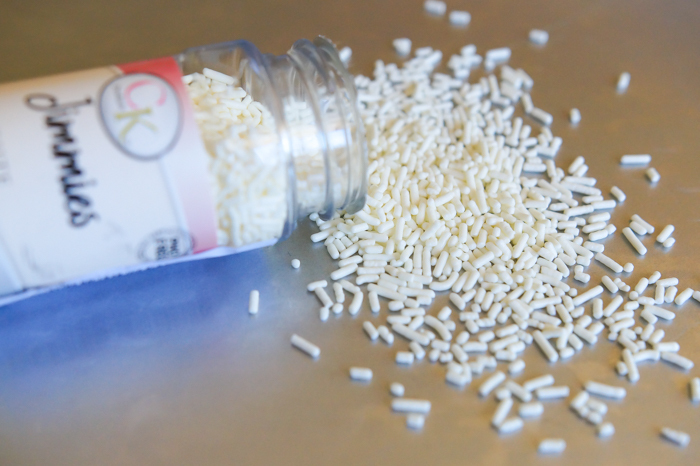 Stir gently and pour into squeeze bottles. 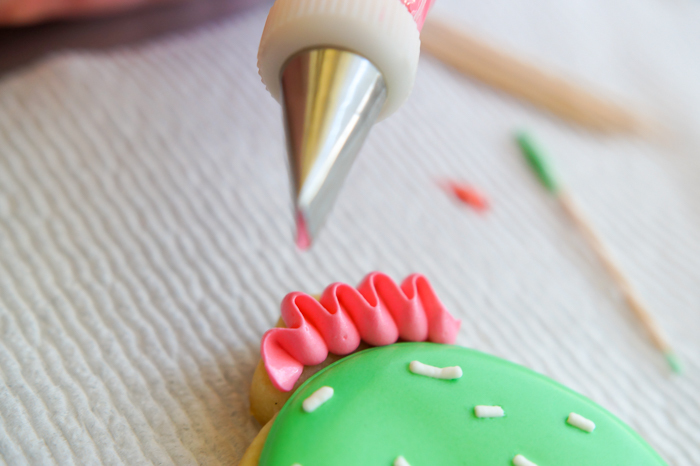 Fill the top with green icing using a toothpick to guide to edges and pop large air bubbles, adding white sprinkles. 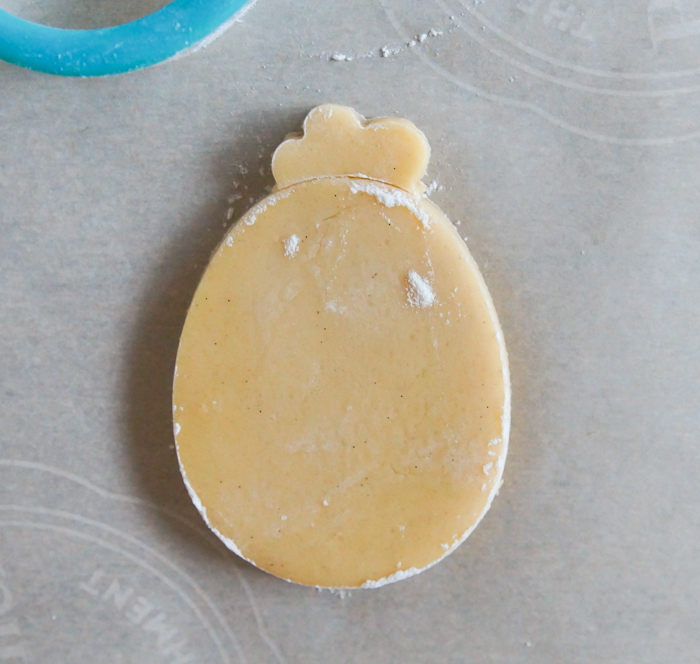 Let the icing dry for 30 minutes or so. Fill in the terracotta color. 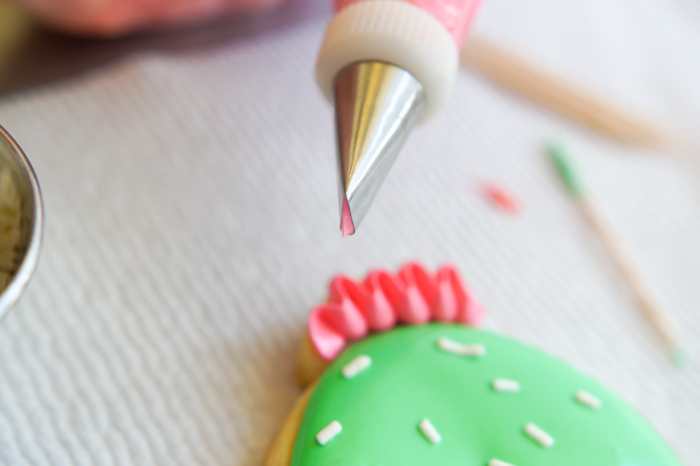 Use a small petal tip, such as a Wilton #101 to make the cactus flowers. Hold the widest part of the tip down while piping in an up and down motion. 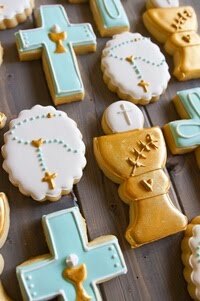 Using the piping consistency royal icing, add detail to the planter with terracotta icing. 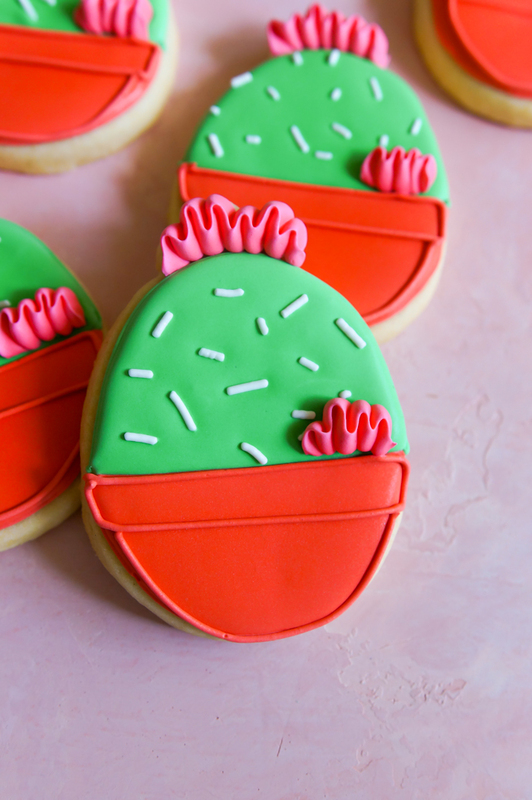 Unicorns, cacti...what else should we make into an Easter egg? All things aside, I really like the decoration. 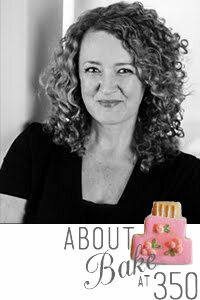 It may seem simple, but being a foodie and a baker, I know one thing for sure that to come up with a design is not as easy as it looks. Kudos to you for making these and the designs! Amazing article! 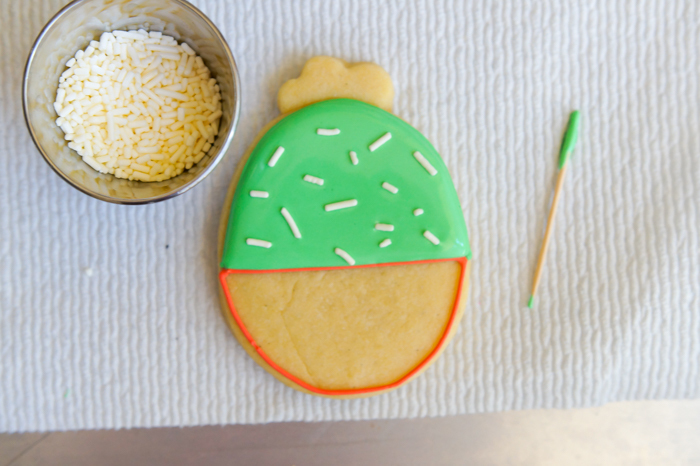 Must be such a pleasure watching you make your beautiful cookies Bridget.Happy Easter. 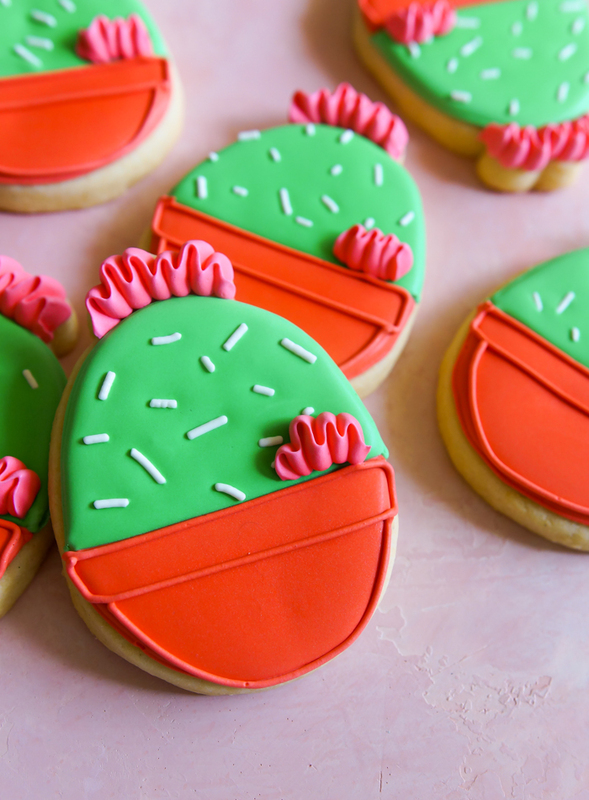 These turned out so darn cute, Bridget!